According to Capablanca, "to improve your game, you must study the endgame before everything else." While I'll continue to study the Catalan opening and practice middle game tactics, my original game plan called for me to devote time to studying the endgame too. That time has come. In his Chess Fundamentals, Capablanca began with some simple mates, to demonstrate the techniques and to teach the power of the pieces. Since I feel reasonably comfortable with the simple mates and since the endgame expert Mark Dvoretsky began with pawn endings in Dvoretsky's Endgame Manual, I'll start my endgame study by focusing on king and pawn versus king endgames. This is Dvoretsky's starting point, which he uses to introduce the concept of key squares. Key squares are "squares whose occupation by the king assures victory, regardless of whose turn it is to move." In this position, with the two kings in direct opposition aligned on the same file with the pawn on the fourth rank, there are three key squares — c6, d6 and e6. It's easy enough to see that with White to move, this is a draw. If White plays Kc5, then Black plays Kc7 while if White plays Ke5, then Black plays Ke7. As long as Black maintains direct opposition between the two kings, White cannot move its king to a key square. Even if White advances its pawn, the game will end with a stalemate (or a draw for insufficient material if White's king allows the pawn to be captured). 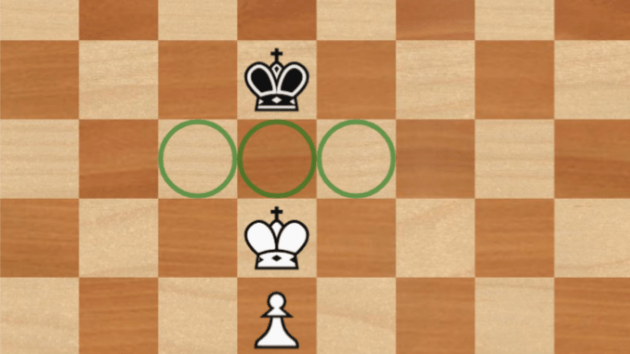 It's also easy to see that with Black to move, this position is a win for White. Although Black wants its king wants to stand its ground on d7, it's in zugzwang and needs to move. Wherever Black moves its king, White can move its king onto a key square, assuring the win for White. So we know that in this position (with the pawn on the fourth rank at d4) the three key squares are located on the sixth rank between the two kings in direct opposition (at c6, d6 and e6). Now that we've established a starting point, let's expand the principles behind this position in three ways. First, as long as the pawn has not advanced beyond the fourth rank, the principles behind this position remain true even if the two kings and the pawn all stand on a different file. (As we'll see in a future post, once a pawn advances beyond the fourth rank, the number of key squares doubles, making it easier for the side with the pawn to win.) With White to move (and with correct play by both sides), these positions (where the pawn is on the fourth rank) are all draws. Second, the principles behind this position remain true even if the pawn stands on the second or third rank, meaning that, with White to move, these positions are all draws too. Third, the principles behind this position remain true even if the two kings in direct opposition stand on a file immediately adjoining the file with the pawn (i.e., with the White king still in contact with its pawn). In other words, these positions are all draws as well. So far, so good. While the concept of key squares is simple enough, it will turn out to be critical in assessing more complicated positions to come, which we'll look at in future posts.